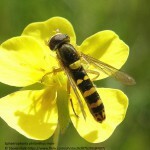 This section of the website provides information on the 180 species of hoverfly (syrphids) that occur in Ireland. Learn about the different species, how to identify them, and how to use Syrph the Net (StN) as tool for biodiversity management. Thanks to Dr Martin Speight who has assisted with the development of the site. 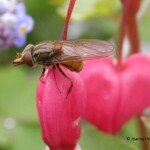 There are approximately 900 species of Syrphidae known in Europe (Speight et al, 2010), with 180 of them occurring in Ireland. Many syrphids have a general resemblance to bees or wasps and some are such good mimics that they are difficult to distinguish from their models. This is true of one of the most frequent and widely distributed of Irish syrphid species, Eristalis tenax, which closely resembles the honey‐bee. E. tenax spends much of its time sitting on flowers, gaining additional protection from being exactly where one might expect to find honey‐bees. Among other Irish species Chrysotoxum fasciatum is a very convincing mimic of social wasps (Vespula) and Volucella bombylans similarly resembles bumble bees (Bombus). There are also mimics of solitary wasps and bees. Doros profuges, for instance, looks like eumenid wasps. But there are many Irish syrphids, like Baccha and Brachyopa species, which do not seem to mimic anything, while others seem only vaguely wasp or bee like, such as Syrphus ribesi and many Cheilosia species. Species accounts for all 180 Irish syprhids can be accessed here. Adult syrphids feed on nectar and pollen. They derive their nectar mostly from plants with yellow or white flowers, because their relatively‐short mouthparts do not allow them to exploit flowers with deeply located nectar sources – normally indicated by pink, red and blue flowers. Male syrphids feed predominantly on nectar, but the females also feed extensively on pollen, which provides them with the protein source they require for egg maturation. Plants with anaemophilous flowers (wind pollinated), like pine trees, poppies, plantains and grasses are frequently used as pollen sources by syrphids. One group of syrphids obtains pollen almost without visiting flowers at all, specialising in mopping up pollen that has accumulated on the foliage of trees, shrubs and bushes. The developmental stages of syrphids are radically different in appearance from the adult insect. Syrphid eggs hatch to produce soft‐bodied larvae, many of which have a characteristically “fly maggot” appearance. However, many different modes of development are found among syrphid genera and the larvae are correspondingly various. The larvae of Microdon (that develop in ants’ nests where they eat the ants’ larvae) look so unlike the usual fly maggot that they were first described as a genus of slug, and it was more than 50 years before it was realised that these “slugs” actually turned into flies once they completed their development. Indeed, Microdon is in many ways so different from other syrphids that it can justifiably be consigned to a separate family, the Microdontidae. Another syrphid larval form is the “rat‐tailed maggot”, an aquatic form whose tail is actually a periscopic respiratory tube, through which the larvae maintain their air supply in often de‐oxygenated water. There are also larval types in which the body surface carries, laterally and or dorsally, a complicated arrangement of sclerotised spike‐like, or frond‐like outgrowths, converting them into quite fearsome‐looking little monsters. Many syrphid larvae are quite colourful. But others are unicolourous pale brown and more‐or‐less cylindrical, with few obvious distinguishing features. Among syrphids there are genera whose larvae are predatory, others whose larvae feed in plant tissues and many others with microphagous/saprophagous larvae. Those that are predatory feed mostly on plant bugs like greenfly, white fly and psyllids. Most of the plant feeders mine leaves, stalks or root bases and bulbs of non‐woody plants, though there are a few that specialise in using the fruiting bodies of large basidiomycete fungi. The saprophagous larvae use a wide range of decaying plant materials, feeding in part on microscopic organisms and partly on the decaying material itself. Many of these larvae are sub‐aquatic or aquatic, the subaquatic forms living in wet mud rich in plant debris, or in cow dung, or decaying vegetation in seasonally‐flooded hollows in grassland or woodland, or compost heaps, others using sap‐runs on tree trunks, or humid, decaying wood etc. The aquatic larvae occur in decaying stems of water plants like Typha, or floating mats of plants like Glyceria, bottom muds rich in organic debris, water buts, water‐filled tree holes and even in shallow pools containing decaying seaweed, in the splash‐zone of rocky beaches. The larval stage of syrphids is followed by a resting stage, the puparium, which equivalent to the chrysalis or pupa of moths or beetles. Essentially, during this resting phase the insect’s tissues are dismantled and reconstructed, so that when it hatches from the puparium it does so as the fully‐formed, adult fly. Speight, M.C.D., Monteil, C., Castella, E. & Sarthou, J.-P. (2010) StN 2010. In: Speight, M.C.D., Castella, E., Sarthou, J.-P. & Monteil, C. (eds). Syrph the Net on CD, Issue 7. The database of European Syrphidae. ISSN 1649-1917. Syrph the Net Publications, Dublin. 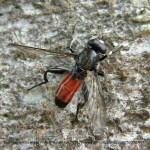 Speight, M. C. D. (2008) Database of Irish Syrphidae (Diptera). Irish Wildlife Manuals, No. 36. National Parks and Wildlife Service, Department of Environment, Heritage and Local Government, Dublin, Ireland.